Please email logos and pictures to anleng56@yahoo.com upon purchase. Makes a unique and memorable gift. Picture perfect for holidays, birthdays, Father's Day, weddings and all occasion. email to: anleng56@yahoo.com any color or black and white photo. 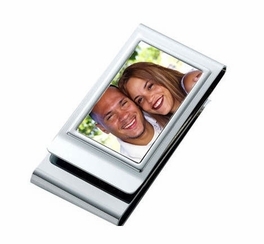 Photos for money clip measures 1.375" X 0.875 This handsome money clip is the perfect accessory to replace that bulky wallet weight down your pocket. Slim and lightweight, silver plated metal engravable. Holds bills and cards.